Generation of large volumes of data each minute has transformed our work in organizations and businesses. No matter what segment you belong, you can’t escape the big data proliferation. Although it is sometimes troublesome to handle and manage the data and retrieve values from it, we are fortunate to a number of benefits that the massive amounts of data provide on the digital platforms. In reality, growing digitalization is the reason behind data explosion. Similarly, digital technologies offer businesses an excellent set of opportunities to get meaningful information from their data. Mobile Analytics, Social Media, Cloud storage are the few means through which consumers, organizations and employees interact with one another. Applications like Simply Gram have made gaining followers on Instagram for the growth of business, seem like a cakewalk. Improving customer services, delivering better results and ROI, engaging more traffic, generating better conversions, outperforming your competitors, attaining cost-effectiveness can only be achieved through analyzing the data. The energy driving this digital transformation is Big Data (source: http://www.digitalhyve.com/). As soon as customers enter their information on the internet – social media, business websites and others, you get to know more about them. Thus, the key is if you ask them for more information (which gives you volumes of data to read, analyze, save and report), you can excel in your marketing techniques. For instance, if you ask them about their choices concerning g to your website or important life events, you can promote your services likewise and gain consumer’s interest to your website by sending them exactly what they want. This can further help retailers to manage their inventory and improve their personalization strategies. The bigger information here also delivers best recommendations and offers and discounts to customers considering their geographic locations as well. The modern tools of Customer relationship management (CRM) and Enterprise Resource Planning (ERP) can help you track and identify the right datasets just because they store a large amount of information about your social media channels, your website potentiality, your business partners and Â consumers. The deeper you wade into data-driven services, the better you know about new marketing processes. This process is eternal. Web content is another important, usability, enterprise and marketing teams can adopt. As there is millions and billions on content available on the internet on various blogging websites, social mediachannels, YouTube and other sources, you can learn to enhance and improve your sales by reading the content and even by promoting your website content, receiving a back or referral link. This lets companies get recognized by larger audiences worldwide and gain more customers. Big data helps companies to make meaningful strategies that minimize costs and maximize results. If you are well aware of your consumers and employees, you can create better and exact projections for what they will do in the future. However, it is important to remember that the pace with which data is evolving, the competition among companies who have gone digital is also increasing. One mistake while analyzing the data concerned to customers, clients or business groups will drive you back on the digital platforms. VaishnaviÂ loves pursuing excellence through writing and have a passion for technology. She has successfully managed and run personal technology magazines and websites. She currently writes for intellipaat.com, a global training company that provides e-learning and professional certification training. 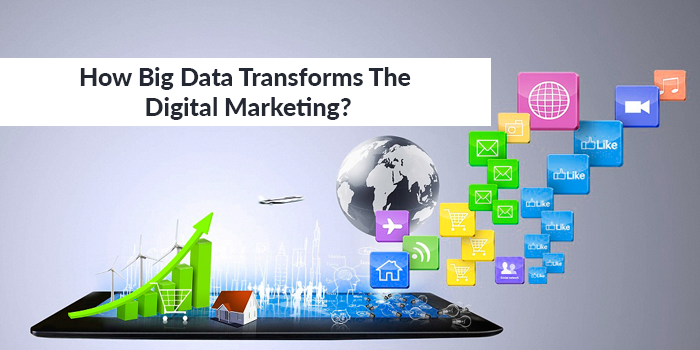 This entry was posted in Marketing, Technology and tagged How Big Data Transforms the Digital Marketing?. Bookmark the permalink.